You know what else spins? Planets! So here's a shout-out to one of the keenest announcements so far this year: a nearby star with seven (count 'em, seven) rocky planets, three of them in the habitable, aka "Goldilocks" zone. What a solar system this is! These planets all orbit very close to their star and to one another, meaning that from any planet's surface the sun looks huge and the neighboring planets are visible as significant, even Moon-sized, disks. See "Dwarf star hosts seven possibly habitable planets." But before you set off for a visit -- it's only about 40 light-years -- there are things to consider. Many of these planets are tidally locked to their star. (Tidally locked: as in one side permanently faces the star [as the Moon faces the Earth], the other side is in permanent darkness. Ferocious winds flow between lit/warm and dark/cold hemispheres -- if the cold half isn't so cold that the atmosphere has frozen out.) There's also the likelihood that this star, like many red-dwarf stars, spits out lots of flares to fry nearby planets. All that said, this is definitely a solar system to keep an (enormous, telescopic) eye on. Our final "spin" addresses competing concepts for teaching introductory physics. Start classically, as with Galilean and Newtonian mechanics, and the way physics historically developed -- that is, with physics relevant to our everyday experiences? Or, in a style now much in vogue, jump straight to such modern, really cool, and counter-intuitive topics as quantum mechanics and relativity -- that don't apply to everyday life? 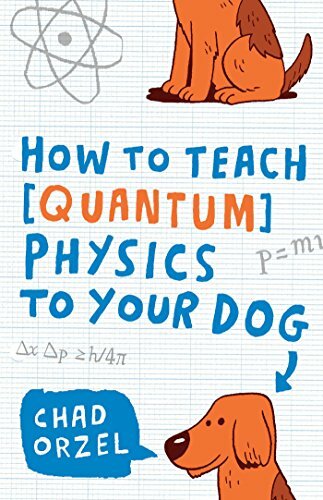 Science popularizer (e.g., How to Teach Quantum Mechanics to your Dog) and physics/astronomy professor Chad Orzel takes on this very topic in "Why Do We Spend So Much Time Teaching Historical Physics?" This is a thought-provoking opinion piece -- and as Chad was among the lecturers at last year's Schrödinger Sessions (see "Schrödinger's frog goes ..."), I can attest to his bona fides as an excellent teacher of complex physical concepts. And now, methinks, I shall spin outta here to deal with some of life's most vexing paperwork. Cuz taxes will make a person's head spin. (Or, as Einstein had it: "The hardest thing in the world to understand is the income tax."